I hope everyone is enjoying the holiday season. I was fortunate to have a few days off to spend some time with my family and take in all the Christmas-day action around the league. The Knicks and Bulls tipped off Saturday’s five-game lineup. There are those who still have their doubts about New York, but they are for real and appear to be getting better and better. The Knicks beat the Bulls at MSG in a highly energized matchup, and they did it with defense for a change. The Knicks got stops when they needed them, rebounds when they needed them, and were able to put up enough points to get the win. On the heels of a huge trade that raised concerns among skeptics, the Magic beat the Celtics in what may wind up being one of their most important victories this season. A win against the team that is arguably the best in the East should reestablish Orlando as a championship contender and restore self-confidence to the squad, which will be so important during the second half of the season. This win could signal a huge turnaround so don’t be surprised if the Magic wind up going on to an 8-10 game winning streak after ending Boston’s. and snap them out of their funk. 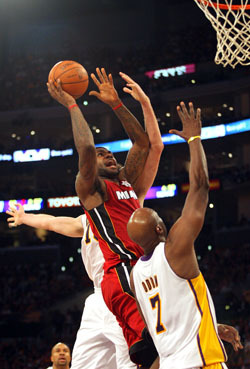 However Miami’s defense was stifling, and the Heat secured an impressive road win at the star-studded Staples Center. They shut down the Lakers’ attack and showcased their greatest assets: speed and quickness which produce steals on one end that they are able to convert into easy, fast-break baskets at the other end. The Nuggets and Thunder continue to jockey for playoff positioning in the fearsome Western Conference. Chris Andersen and Kenyon Martin have returned to Denver’s lineup. But despite getting back two of their big men, they still wound up playing shorthanded as Carmelo Anthony is spending time with his family following the tragic loss of his sister. Denver put up a good fight, but Kevin Durant led the Thunder to their first Christmas Day win with 44 points. the playoff race, but it will be difficult.